What are Some Different Types of Vases? Porcelain vases are often quite expensive. Ceramic pottery vases are often very rustic. Vases have been popular both outdoors and indoors since ancient times. Ancient vases were often used for cemetery purposes, but today we have many different types for different uses. They can be made from anything from ceramic and porcelain to glass or metal. 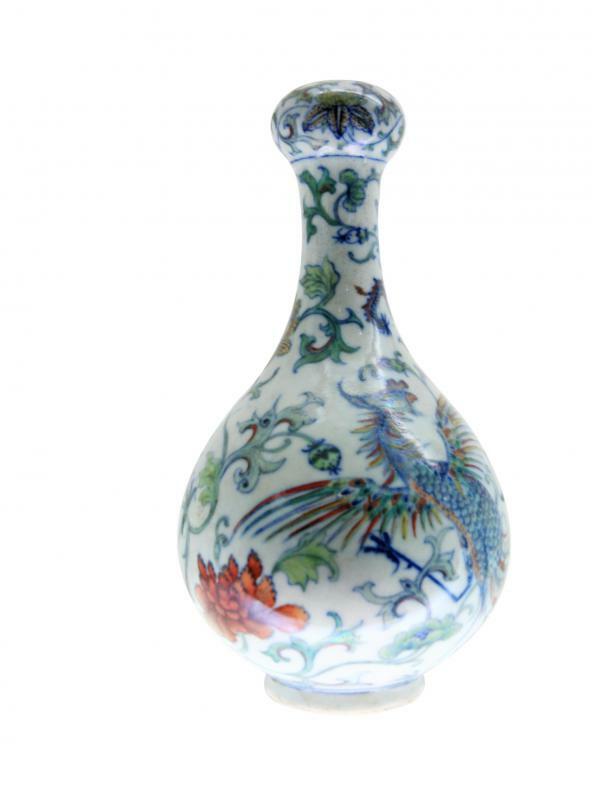 The most expensive in the world is the Ming vase. Ming vases are considered very rare and valuable. They date back to China's final imperial dynasty of 1386 - 1644. Ming ceramic pottery is mostly blue and white. A Ming vase can be urn-shaped or even bird-shaped. An unglazed ring inside a red-brown ring on the foot, or base, of the Ming vase marks it as a true Ming. Ancient Greek pottery includes distinctive and sophisticated paintings. By the 8th century BC, figures of humans were used on cemetery vases to mark graves. Attic vases are black and red-toned and include figures from Greek mythology such as Hercules. Greek pottery often tells a story in the use of human and animal figures painted on it. Many ancient Greek examples feature handles on the widest part. Glass vases can be clear or opaque. Crystal vases are often cut into intricate patterns. Glass varieties are less expensive than crystal, and the large sized glass ones are often used today for dramatic fruit or floral displays. Bud vases can be made of glass, crystal, porcelain or ceramic and are tall and narrow. They are designed to hold a branch with a bud that will bloom into a full flower. 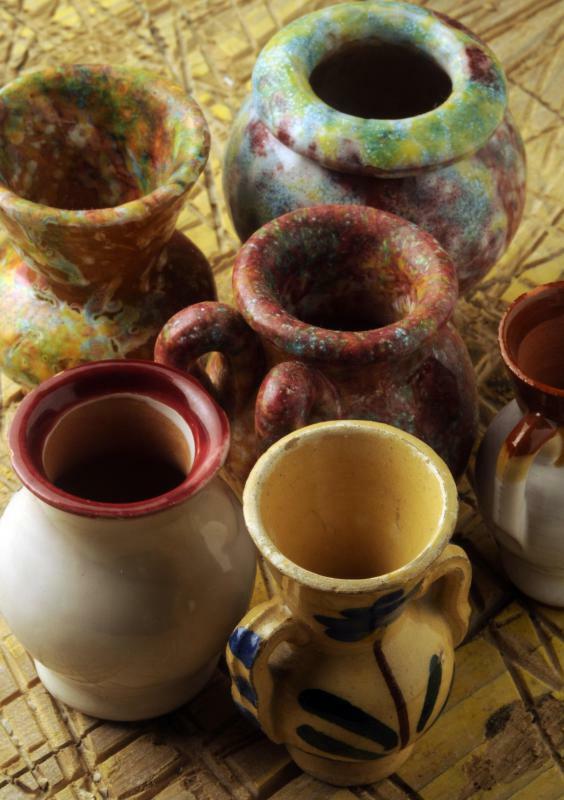 Ceramic pottery vases are often handmade and may have a rustic, earthy look to them. However, depending on the finish used, ceramic pottery can also look very sophisticated. Chinese porcelain ones are usually extremely detailed with a main color of red, yellow or blue. Modern cemetery vases hold flowers placed at the memorial site and many are cylindrical, cone-shaped or urn-shaped. Some are designed to hold silk flowers rather than fresh flowers. Granite, marble, bronze and cast metals are common materials used for this type. Bronze is expensive and cast metals are less expensive. How Do I Choose the Best Handmade Pottery? How Do I Choose Quality Antique Chinese Vases? How Do I Choose the Best Crystal Vase? What Is a Pedestal Vase? What Is an Orrefors Vase? What Is a Galle Vase? What Is a Baccarat Vase? Vases, whether tall or short, big or small; can be used for more than just holding flowers! Don’t be afraid to use your imagination a little bit when it comes to decorating your home. After all, who doesn’t have at least five generic, glass vases underneath the counter from old arrangements sent through the florist? Everyone does! And then, once those flowers have died, you have no idea what to do with the vases! Well, there are actually many ways that you can use them. For larger vases, drop some multicolored stones into the bottom and place a pillar candle in their midst. section) and candles can be extremely cheap as well! Or, get happy with some paper mache for a mosaic look with a skinnier, tall vase. Place it on your desk to hold your favorite pens. Don’t be afraid to look at that glass vase and see the potential it holds, even if it is a little different form the norm! Take a chance! You know, I have recently seen some of the prettiest things that are also long lasting in the world of vases. I personally have always had a few vases underneath the sink for sudden urges for beautiful flowers on the island or dinner table. However, in no time, those gorgeous buds are dead and making a mess instead of bringing beauty inside. So, when I went to my sister's two different times, two weeks a part, I was wondering how in the world she had kept the same centerpiece alive on her antique table in the foyer. Come to find out, they were actually not live flowers at all! not. And, the ‘water’ in the bottom of the vase was actually a special kind of solution that you can pour into vases to hold those flowers in place. I’ve got to tell you, though, that it certainly fooled me one hundred percent, and now I’ve got one in my foyer as well! I have seen some beautiful vases that are very decorative and ornate. I have two large vases inside the entry way to my home that are conversation pieces in themselves. These unique vases were made by a friend of mine who makes a lot of pottery pieces. I love decorating with neutral tones in my home, and the color of these vases goes perfectly with my decor. I keep artificial flowers in them, and change them according to season or holiday. I never get tired of these two vases sitting by my door, and think they give a very warm welcome to my guests when then come in my home. A very simple, yet elegant way to decorate for a wedding reception is to use small vases filled with fresh flowers at each table. Even if you use one single flower, fresh flowers are always a nice touch. When my daughter was getting married, we were on a limited budget, but I wanted her day to be special. I bought several wedding vases at a party consignment store that had probably only been used one time before. I filled each of these with one single rose and used many different colors of roses. Even though this was simple and affordable, it really added a nice touch to each table. The vases weren't too tall, but just the right size. Once I put the rose in the vase, they were still short enough that you could visit with the person on the other side of the table without looking around a big, tall centerpiece. I think large, clear vases make the most stunning centerpieces you can find. I love to fill a clear vase with long stemmed flowers to instantly change the look of any room. There is something about the long green stems showing through the vase that adds to the beauty and charm. I grow a lot of flowers, and use whatever is blooming at that time of the year. In the spring, I love to fill a vase with tulips and lilacs. In the summer you can never go wrong with a vase full of roses. The fall is the perfect time to showcase any mums. Their bright colors will last a long time in a vase if you change the water frequently. I really like those decorative floor vases you can find at furniture showrooms. Lots of them are between three and four feet tall, and they give a dramatic, modern look to a room. Often, when they are set up for display, they will be filled with twisted sticks having no leaves. I like the dramatic, artistic effect of this. I saw two of these floor vases that I really loved. One was a deep red color with flecks of black. It looked like it would have a grainy texture, but it was as smooth as glass. The other vase was bright blue with a white cracked pattern. It looked like it was about to shatter, but it was just as smooth as the first one. Both of these vases were narrow. They bulged out in the middle, but just by a couple of inches. I had to take a ceramic class in college, and I made several vases on the wheel. They are definitely one-of-a-kind, because their shapes were accidental. I tried to make them stand up straight. I wanted to make the bases narrower than the mouths, sort of like a drinking glass. They ended up looking more like twisters than vases. I like them because they are odd. I made them hunter green and shiny, so they go well with plant colors. Since their mouths are wide, I have to pack a lot of flowers in them to support the bouquet. If I don’t have enough flowers, I will simply tie them together with green string to make them look healthy and strong. I like to buy vases at secondhand stores, because they are price very low, and I can find some very interesting shapes and colors. I recently found several unique vases for one to two dollars each. I think that my favorite find is a burgundy colored transparent glass vase. It is short and round with a wide mouth, and it is perfect for holding roses. I have several rosebushes, and I like to keep rose bouquets in vases on my coffee table and as a centerpiece on my dining room table. With this vase, I can cut big masses of rose blooms on medium to short stems. I pack them somewhat tight, leaving just enough space for them to spread out a little when I release my grip. Bud vases are excellent for holding flowers with tall stems. If placed in a vase with a wide mouth, these would spread out too much, making the bouquet look sparse. I have several bud vases that I use to hold zinnia cuttings. I don’t like to cut too many flowers at once, because that takes away from the beauty of my garden. These vases are perfect for holding up to five zinnias of varying lengths. Also, if I want to give someone just one flower to brighten their day, I use a bud vase. I leave a couple of leaves low on the stem just above the mouth of the vase. Anyone know a nice source on the Hittite Reliefvases? (like those found at Bitik, Inandik etc.). I'm writing a dissertation about them and can't find pictures (that aren't grainy or in black and white) of the whole vases, only detail-shots.